A damaged temple in the UNESCO World Heritage site of Bhaktapur on the outskirts of the Nepalese capital Kathmandu after Saturday’s earthquake. Some of the world’s most important historical, cultural and natural sites were already battered by war and disasters before things recently got worse. 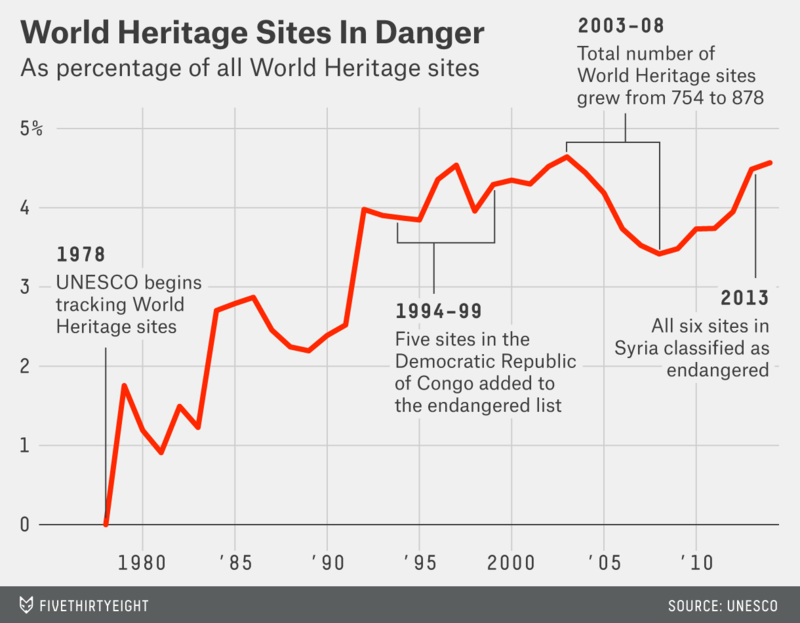 Last year, 46 of 1,007 places designated as World Heritage sites by UNESCO were in danger, a nearly unprecedented level of risk, just behind the all-time high set in 2003. Then on Saturday, an earthquake in Nepal leveled several of the monuments in the Kathmandu Valley that together are a World Heritage site. These monuments include urban squares and important Buddhist and Hindu sites. The quake also damaged Sagarmatha National Park, a section of the Himalayas that includes Mount Everest. “I am deeply aggrieved by the magnitude of human loss caused by the earthquake in Nepal,” Irina Bokova, director-general of UNESCO, said in a statement. “I am also shocked by its devastating impact on the unique cultural heritage in the country.” Bokova told The New York Times that she was unaware of any modern natural disaster that had damaged so much of the world’s cultural heritage. The 46 sites worldwide that UNESCO classifies as in danger don’t yet include the Kathmandu Valley or Hatra. Adding sites to the danger list is something that only the World Heritage Committee can do, Roni Amelan, English editor of UNESCO’s press service, said in an email, and the committee is not scheduled to meet again until June. In the meantime, UNESCO plans to send a mission to Nepal in the coming weeks, to supplement work by UNESCO’s Kathmandu office. UNESCO already has a lot of work to do conserving World Heritage sites. The 46 endangered sites are an all-time high for the organization, which is observing its 70th anniversary this year and has been tracking heritage sites since 1978. With such a wide range of sites on the list, it’s not unusual for threats as different as earthquakes and religious extremism to coincide. The current list of 46 endangered sites includes Everglades National Park (partly because of reduction of water flow) and Liverpool’s docklands (because of a building development). Edinburgh could join Kathmandu and Hatra on the list of sites to be discussed in June, after a UNESCO adviser attended a meeting in February discussing developers’ plans to redesign a historic hotel. On the other hand, the current peak does reflect, in large part, one major cause. UNESCO added all six sites in Syria to its endangered list in 2013 because of threats from antiquities smuggling, which is booming during the country’s ongoing civil war. The Syrian sites represent nearly half the endangered sites in Arab states and explain why that region has one of the highest proportions of sites that are endangered in the world.